All concerns that suggest one or more of the HEE Quality Framework Standards for education quality are not being met must be escalated to the Quality & Commissioning (Q&C) team, see the Meet the Team page for contact details, either through a conversation in the first instance or the Quality Concerns Alert (QCA) Form which incorporates the national HEE Risk Matrix. Concerns should be articulated and aligned to the relevant quality standard(s) and assessed based on the likelihood of the incident occurring and the impact the incident would have should it occur. The assessment also includes consideration of the controls in place to mitigate the risks identified, together with any further actions required to manage and limit the risk. HEE has developed a pathway for learners to raise, and where appropriate, escalate concerns. 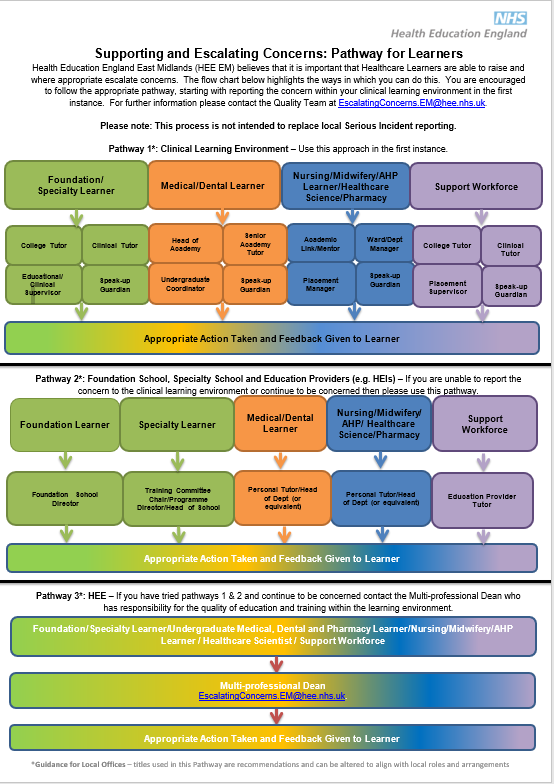 The pathway encourages learners to utilise local mechanisms, within their clinical learning environment initially, escalating to pathway 2 and 3 if they continue to be concerned or the they feel the pathway is inappropriate for their individual concern. This pathway is not intended to replace local Serious Incident reporting, rather it adds an additional layer of support for learners if they continue to have concerns.